The Mar. 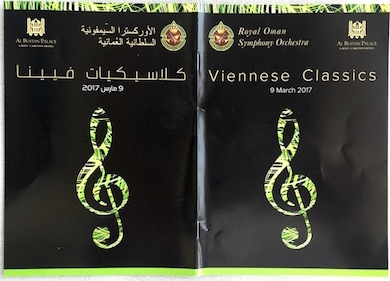 9, 2017 program of the Royal Oman Symphony Orchestra. Founded in 1985 and offering its first public concert two years later, ROSO is very much a personal project of the long-ruling Sultan Qaboos bin Said (b. 1940, r. 1970-). As a flattering newspaper profile explains, "ROSO emerged as a novel and a poetic idea; an idea born in the heart and soul of a benevolent leader. The idea was nourished by passion, love, and understanding of culture as a tool towards cultural diplomacy, understanding, diplomacy." 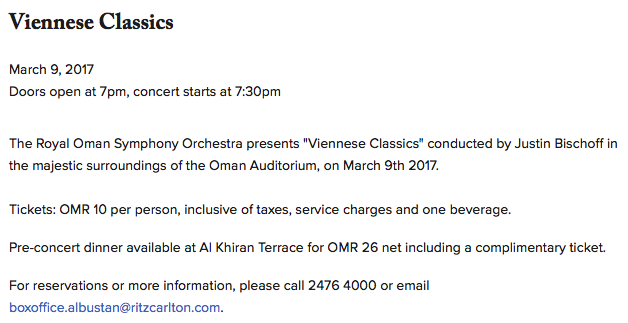 The concert took place in a European-style classical music concert hall, the Oman Auditorium. The audience filled about half the auditorium and was about 90 percent Western, with the rest Omani with a sprinkling of South Asians. Tickets nominally cost US$25 but many were given away. In the orchestra pit, the men wore elegant white-tie tuxedoes; the women wore red hijabs over green dresses, except for the female violin soloist, who wore white on white. 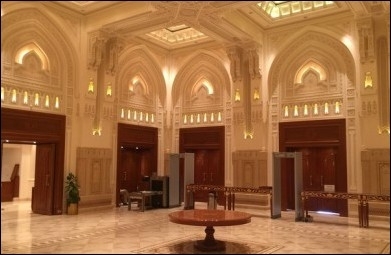 The interior of the Royal Opera House Muscat. (6) The Japanese and Chinese have mastered both Western music and modernity. The Omanis have just started on this path – the country was medieval as recently as 1970 – and I hope they will also become proficient with both.